Kids' Book Review: Review: Where's Bear? When you are little your first best friend is often your teddy bear. 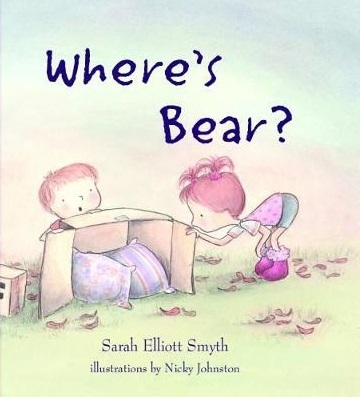 Sarah Elliott Smyth and illustrator Nicky Johnston have beautifully captured this special relationship between Sophie and Bear in their story Where's Bear? Just as Bear dives off the castle wall of boxes, to save Sophie from a slobbering doglike dragon, their imaginative play is interrupted by dinner time. When Sophie returns to the lounge room, Bear is missing. She searches the whole house but he is no where to be found. Sophie knows that she needs to look for Bear outside. Her knees tremble at the thought of entering the dark to save Bear from the shadow monster. Will Sophie find Bear? Where's Bear? is a delightful story about a little child needing to find courage when facing fears. Smyth's selection of a common childhood fear, the dark, helps deliver this message in a gentle way. Smyth has written a story using language that builds adventure and suspense. Suspense is built when Sophie '...peered out into the dark.' and where noises snitch, scritch, crunch, snuffle, swish and rumble. While Johnston has illustrated Where's Bear? using colours, gestures and expressions to show how Sophie's emotions change throughout the story, especially as the search for Bear intensifies. I love the inclusion of Sophie's blanket carrying little brother, as it gives her character more responsibilities and helps increase Sophie's bravery. Where's Bear? is a not only a story about over coming fear, it is also about love. Love of an older sister for her brother. And love of your first childhood friend, your teddy bear. The last page will leave readers with a true aww moment. Nicky Johnston is an author and illustrator, some of her books include; The Fix-It Man, Grandma Forgets, Happythoughts are Everywhere and Actually, I Can.